ACORN member: Fired board members had said "things that were not true"
(CNN) -- Community organizing group ACORN, investigated this year for filing fraudulent voter registration forms, has fired two board members it had asked to investigate allegations that an ACORN founder's brother embezzled nearly $1 million. The fired board members were investigating allegations that money was embezzled from ACORN eight years ago. An internal document from the ACORN executive board, obtained by CNN, shows that members Karen Inman and Marcel Reid were "removed from any office or committee position you may have held." A separate document says that "the memberships of Karen Inman and Marcel Reid in ACORN is canceled, and they are removed from the Association Board." The documents, dated November 11, are signed by Maude Hurd, president of the ACORN Association Board. Hurd was not immediately available for comment Thursday afternoon, an ACORN receptionist said. But ACORN member Gloria Brown, speaking from the group's main office in New Orleans, Louisiana, said in response to a CNN request for comment that Inman and Reid were removed because "they've been saying from the beginning things that were not true." Brown said she was the only person available from ACORN to speak with CNN at the moment. Inman, who is from Minnesota, contends that only her state branch can remove her and it has not done so. "Why would you want us not to clean up things?" she asked. "Why would you not want to do your own investigation instead of bringing in the sheriff?" Asked whether she thinks the sheriff is coming, she answered: "I think the sheriff's coming." The possible embezzlement by Dale Rathke, brother of ACORN founder Wade Rathke, allegedly occurred about eight years ago. But the ACORN board did not find out about it until this year. In July, the ACORN board selected an interim management committee to look at the possible embezzlement and its concealment. Inman and Reid were two of the members appointed to the committee. When an ACORN affiliate that acts as the group's accounting firm denied the committee members access to the books, Inman said, she, Reid and several others filed a lawsuit to have the court order ACORN to preserve the books and give them access to all accounting matters. That suit became known as the ACORN 8 because, according to Inman, eight ACORN people signed onto it. She now says there are 25 members demanding the accountability. ACORN said the interim management committee essentially had no authority and countersued. "They didn't have authority from that committee," ACORN member Brown said Thursday. "They filed this lawsuit that basically was not on behalf of the board at all." According to the documents obtained by CNN, the ACORN executive board met Sunday and decided to remove Inman and Reid and any other members participating in the lawsuit. The problems at ACORN already have cost it the financial support of one of its major donors. The Catholic Campaign for Human Development froze contributions to ACORN in June amid the embezzlement allegations. This week, as the U.S. Conference of Catholic Bishops met in Baltimore, Maryland, the campaign's chairman said it was cutting all ties with the group. "We simply had too many questions and concerns to permit further CCHD funding of ACORN groups," Roger Morin, the auxiliary bishop of New Orleans, told his colleagues in an earlier letter to the conference. The CCHD has donated more than $7.3 million to ACORN-related projects over the past decade, including $40,000 to an ACORN chapter in Las Vegas, Nevada, that was raided before the November 4 election in an investigation into fraudulent voter registration forms. ACORN, which conducts voter registration drives, has acknowledged that some of its hires had turned in improper voter registrations. Those workers were fired and some even prosecuted, the group said. 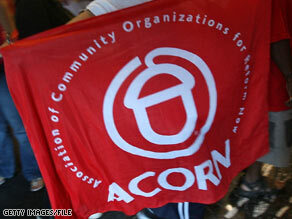 "In nearly every case that has been reported, it was ACORN that discovered the bad forms and called them to the attention of election authorities, putting the forms in a package that identified them in writing as suspicious, encouraging election officials to investigate, and offering to help with prosecutions," ACORN said in an October 9 news release. Morin said a church review completed earlier this month found ACORN no longer meets standards for further funding. In a statement to CNN, ACORN Executive Director Steven Kest said his group is grateful for the church's funding. "We look forward to continuing discussions with CCHD officials and the bishops in the months ahead in hopes that we can continue working together on projects which have been so important to so many in low-income neighborhoods across the country," Kest said. But Ralph McCloud, the Human Development campaign's director, said the church has "severed ties" with ACORN and there are no plans for further discussion. CNN's Arthur Brice and Marcus Hooper contributed to this report.